There are several New Year’s themes that run through all today’s texts: time, God’s powerful presence in the world, the ability to change, and hope. Children can explore all these themes. % Time feels different to children who have known so little of it. For them years last forever. They are just beginning to sort out the difference between how long a time period feels and the fact that an hour is always 60 minutes long no matter how it feels. After exploring the fact that the same amount of time can feel short or long, point to alpha-omega symbols in your sanctuary (paraments, windows, furnishings). Explain that these are the first and last letters of the Greek alphabet. Note that saying God is alpha and omega is the same as saying God is A to Z. Celebrate that God was before time began and will be after time ends and is with us in every bit of our time now. Before singing “Our God, Our Help in Ages Past” take time to review the words of one or all of the verses. Start with verse 3 “a thousand ages in thy sight” putting it into your own words. Point out that when you have lived long enough to celebrate only 6 Christmases, it seems a long time between Christmases. But, when you have lived long enough to experience 86 Christmases, the time between Christmases seems to fly by. It is strange (especially if you are 6) but very true. Then, read the first lines of this verse and ponder the possibility that not a thousand Christmases but a thousand ages (hundreds of thousands of Christmases) are like one evening to God. Verse 2 says that God (for whom a 100 ages is an evening) is with us at all times. 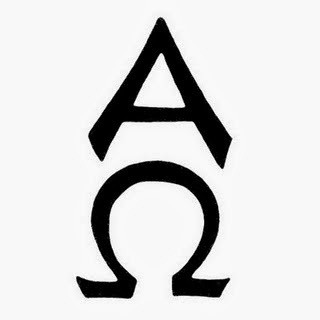 You might want to connect to the alpha and omega symbols in paraments, windows, or furnishings in the sanctuary. Verse 1 is both the introduction and the summary. I’d start with other verses, then return to God as our “hope” and “home” in all times. I’d focus on the first 3 verses with the children. The adults will get the last two on their own and the children will grow into them. % Change is possible. We can never be totally stuck. God gives us unlimited fresh starts. Actually children will quickly point out that there are some things they cannot change, e.g. their size, their athletic or musical ability (or lack of it),the family they live in, whether they have enough money for what they need and want. Acknowledge this and help identify what we can and cannot change. Only then, talk about New Year’s Day as a good day to identify one change you can make, want to make, and will work on making. Warn that change is not easy. We have to expect to mess up and not quit when it gets hard. We are not like toy transformers that change in a flick of a few levers. Change takes time and work. Invite worshipers of all ages to write one change they would like to make during the new year on a slip of paper (maybe some space left at the bottom of the printed order of worship) and to put it in the offering plate as a gift to God. In the offertory prayer mention this gifts of commitments to changes. % The epiphany theme “Arise, Shine” resonates with children as they return to school in a new year. Especially if you need to combine New Year’s and Epiphany themes go to Epiphany Year A for ideas. % The response to all these themes is hope for the new year – and all of the future. Sing the Argentine “Canto de Esperanza” (Song of Hope) which appears in many recent denominational hymnals. It is a prayer for the new year that could be sung at the benediction. If it is new to the congregation, read through the words before singing it. Because it is short, it can be sung two or three times and guarantee that worshippers will be humming it all day. % Doors are good images for New Years Day. We have closed the door on the last year and opened the door to a new door. When you walk through a door things change. When you go from outside to inside, you use a quieter voice, you wipe off (even take off) your shoes, you expect to do different things. Walking through doors tells us where we are and who we are. There are several ways to use doors in worship on New Year’s Day. Borrow the Chalking the Door ritual which is associated with Epiphany but fits nicely on New Year’s Day too. It is basically a house blessing. 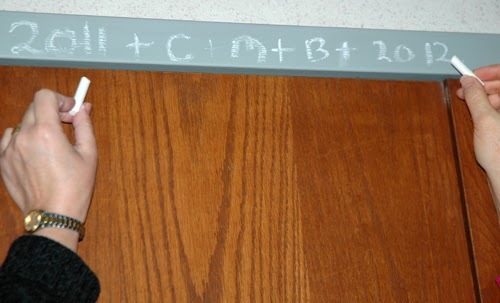 Using chalk, members of the congregation or household write on the door frame the year’s date and the letters C, B, and M (the initials of the three wise men). Prayer is then offered asking that the door welcome many visitors during the coming year and that all who come through the doorway be blessed. Write on the church doors during the worship service with the prayers for all who will come through the doors this year (worshipers, brides and grooms, parents bringing babies to be baptized, families and friends coming to bury their dead, members of community groups which will use the facilities,….). Then encourage households to repeat it in their own homes. Print a simple blessing for use at both church and home in the order of worship and give out small pieces of white chalk for home use. Below is a sample blessing. God of doors and homes, bless this home this year and every year. May the love and joy in this home overflow and spread into the community and the world. 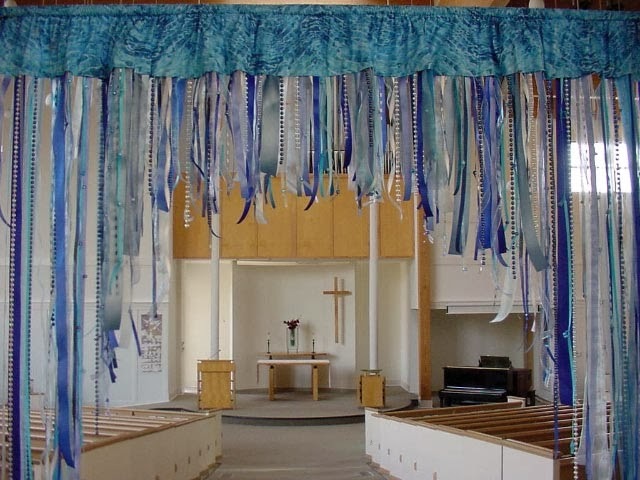 If your congregation decorates the doors with blue streamers on baptismal days, hang those streamers today. 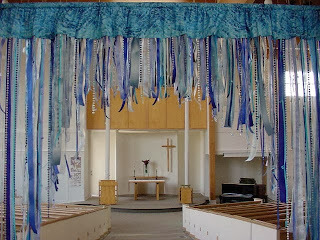 Point out that every time we walk through those streamers we not only celebrate the baptism of that day, but recall our own baptism and the fact that God loves us and forgives. God gives us a endless new starts, a new start every day, and a new year today. If you do not plan to do it on The Baptism of the Lord Sunday, do a remembering of our baptisms service today. Check out the Judgment Doors in the section on the gospel text for the day. % To children Ecclesiastes says that life is full of all sorts of things and that all of them are good (in the sense of blessed). Help the children catch the significance of the 14 rather general pairs of opposites by exploring several for them. Vs 2 We all are born and we all die. Birth and death are simply part of God’s plan for our lives. Vs. 2b There are seasons. We can’t plant seeds during the winter or harvest them in the spring. Vs. 6b There are times we need to save things carefully - like putting aside clothes to wear again. There are other times when we need to let things go - like giving away old clothes or toys we have outgrown. Sometimes it is hard to know which time it is. Vs. 7b There is a time to keep silent and a time to speak. Children are quick to list examples of these times. Vs 4 (I’d save this verse for last even though it comes earlier in the list.) There are times when life is sad and we cry. There are other times when life is so happy that we laugh a lot. Both of these times are good, blessed times. We may prefer the happy, laughing times. But, God is with us in both happy and sad times. 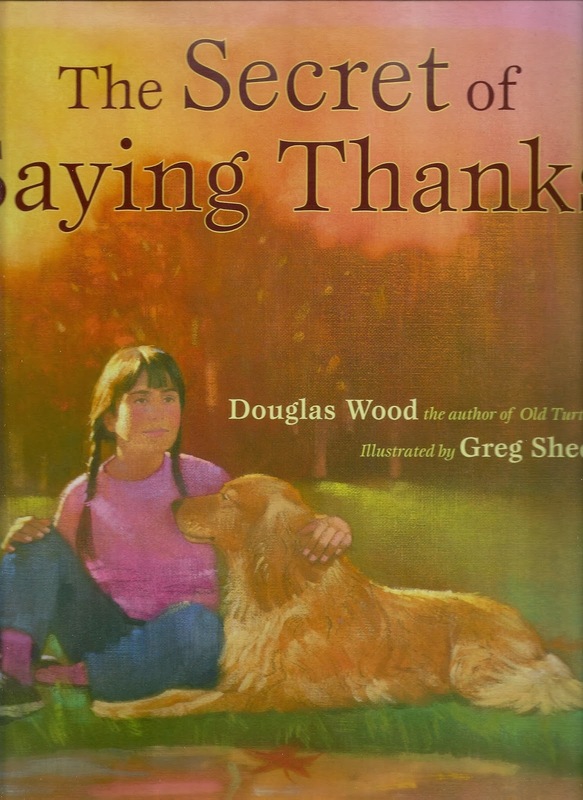 This is one of those children’s books that could be read at the conclusion of the sermon to sum it all up. It could also be read with the children up front , sitting behind you so they can see the pictures over your shoulders. Or, it could be read to the whole congregation having encouraged them to close their eyes and imagine each scene you read. % Read from Today’s English Version which uses vocabulary children understand more readily – “Lord” instead of “Sovereign,” “greatness” instead of “majesty,” and the moon and stars that you “made” rather than “established.” Most adults will not notice the difference, but the children will. % I do recall some years that began with a sense of promise for the world. But, often we begin a new year with a sense of foreboding. The children sense that even when they do not understand the details of that year’s fears. The writer of Revelation insists that we need not worry about these things that make us feel like the world is about to end. For one thing, only God knows when the world will end. For another thing, the all powerful God who loves us is in control and moving all of history toward a good end. 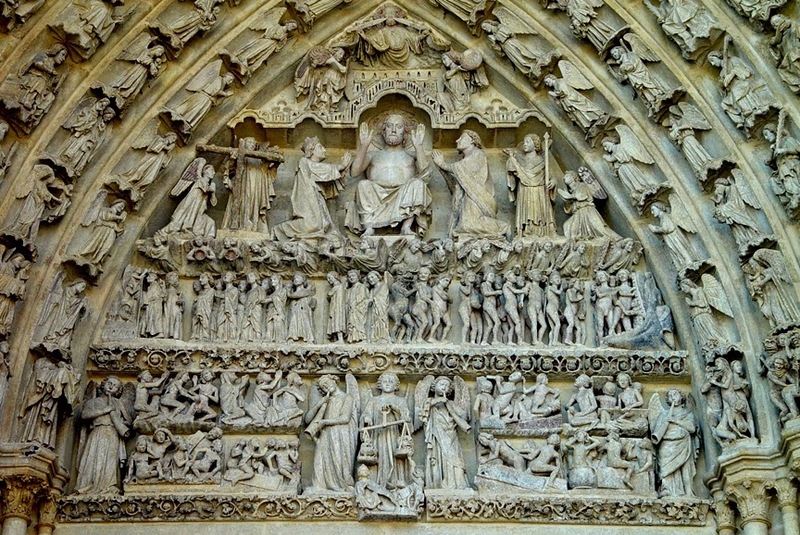 Check the worship themes at the beginning of this post for ideas highlighting the alpha and omega, judgment doors in European cathedrals, and a song of Hope with which to celebrate the fact that we can face the future without fear. 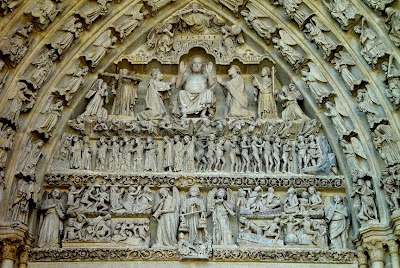 ﻿﻿﻿% Medieval European Cathedrals made all the doors into the sanctuary Last Judgment Doors which illustrate this text. Usually there was a stone figure of Christ the Judge over the door. Often under him there were layers of figures with the saintly sheep on one side and the evil goats on the other. Curved around these figures and the doors were gathered angels and biblical characters in worship. Show pictures of these doors and imagine walking through them every week to worship. If there are any special features of the entrances to your sanctuary, point them out and explain what it means to walk past/through them as you enter worship. For example, many doors feature a cross. So, say what it means to come through this sign of God’s love and forgiveness into worship every week. % Where Love Is There God is Also, by Leo Tolstoy, is a short story about a cobbler who hears Jesus promise to visit him the next day. He is excited, but disappointed when the only visitors he gets are an elderly poor man shoveling snow who he invited in for tea, a young mother and infant to whom he gave his coat, and a boy who has been caught taking an apple from a seller. That night Jesus reveals that he was with each of those people. This story is presented for children in several DVD/Videos and books. It may be titled The Shoemaker’s Dream or Martin the Cobbler. It may be found in some public libraries. It is often listed as a Christmas item in libraries or stores.